Liam creates amazing and unforgettable staff conferences! Whatever your business aims, Liam can create a conference to help your staff cope with change, launch a new corporate vision or celebrate your success. Liam ensures a fantastic conference experience that inspires your people to be proud of your company and deliver fantastic customer. Liam works with only the very best corporate speakers, entertainers and inspirational acts who are the absolute best in the business to give you an amazing result every time. Liam is a vastly experienced professional speaker who specialises in Employee Engagement and Culture Change. He has been performing since he was 9 years old, first as a singer songwriter who recorded with John Brough producer, of the Beautiful South, then as a successful motivational speaker who has performed in many of the UK's leading venues. He has also worked as a successful people engagement consultant experienced in every aspect of people motivation, from performance, film or the written word and internal communications to put it simply Liam understands what it takes to inspire and engage an audience and every aspect of putting on a successful conference and embedding a positive business culture. He works with some of the country's most inspirational corporate performers and always knows and understand what is fresh, innovative and most importantly new! Liam's passion is creative conference organisation, utilising the full range of his talents and experience. He enables you to ensure your conference successfully achieves you business goals. Why bother putting on the expense of a staff conference if it doesn't help you achieve what you want to move your business forwards. Not only that he can advise you on how to embed the messages into your business after the conference for the following 12 months or more. 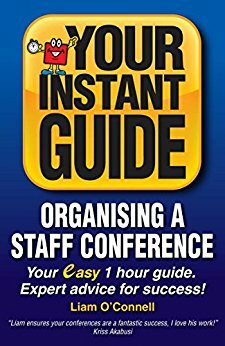 His book ‘Your instant guide to organising a staff conference' is available here and his other books don't feed the ducks and my fires gone out have been published in countries throughout the world. "I really can't praise Liam enough - his professionalism and attention to detail alongside his creative talents are second to none! Our staff were buzzing after the recent three staff conferences that he facilitated and designed for us. The staff feedback has been incredibly positive - they simply loved the days!Not only did we drive home some important serious messages but we had amazing fun days too." "This is the first time that we have worked with Liam in organising our staff conference. From the moment that he first walked into the room to plan the event the energy was infectious and this continued all through to the very end of the conference. Feedback from everyone at the conference was that it was a great event and we’re all looking forward to the next one." "Liam energised us all at our conference making it engaging and uplifting, many thanks"
"Liam knowledge and experience ensures your conferences are a fantastic success. I love his work!" "Liam has a wonderful knack of helping you see things in a different way. With a fun and engaging style his philosophy helps drive a culture of performance and fulfilment"